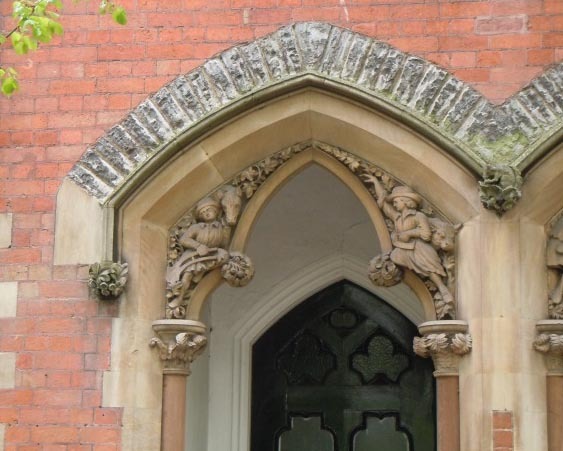 Report from Walk 7 – Watson Fothergill Buildings in Nottingham. Two walks were held in November to introduce members to the work of Watson Fothergill, a prolific local architect who designed many varied buildings during the mid to late 19th century. As we learned, a lot of his work has been lost through redevelopment but many still remain. We began the tour at the Council House and looking towards ‘Primark’ recalled the Black Boy Inn, which stood until the late 1960’s. We viewed the plaque next to the shop, which commemorates the Inn, and many commented that they had not noticed it before. We then moved on to look at The Queen’s Chambers on Long Row and both with and without the aid of binoculars admired the elaborate detail on the buildings and the stone carving of Queen Victoria. We then proceeded up King Street to view the Jessop Building, another highly decorative example of Fothergill’s work. Continuing up on to Upper Parliament Street we viewed the Express Buildings, one of his earlier works. Although undergoing some internal renovation the builders kindly moved their boards to allow us to view the ornate tiles in the entrance and blue plaque dedicated to Graham Greene. We continued on to Lower Parliament Street to premises originally used by Furley and Co and admired the terracotta panels depicting different trades. Then on to Thurland Street where we looked at the old Nottingham and Notts Bank head office and it’s mortgage monkey. With the kind permission of the occupiers (All Saints) went inside to view many original features. 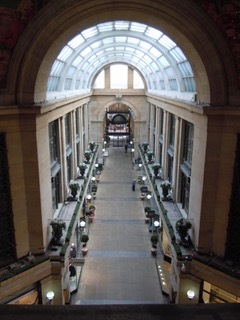 Our final stop was the Watson Fothergill Offices on George Street before we retreated for a much needed warming drink. I think in future we shall all be looking up far more as we walk around the city! 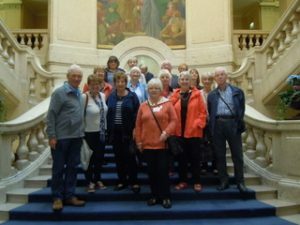 The Discovering Nottingham Group visited the Council House twice in October and both visits were very interesting but totally different. 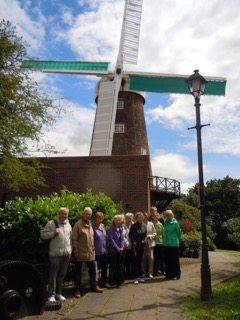 The first visit we were taken round by a lady who had been a City Councillor for many years. We started at the bottom of the building and climbed up to the second floor – she explained that present day Councillors are based at Loxley House near the Midland Station and that the Council House was now used by the Coroner’s Office which meant that as there was an inquest taking place we wouldn’t be able to see the Council Chamber. There was also a meeting in the ballroom so to make up for this she showed us two very interesting books. 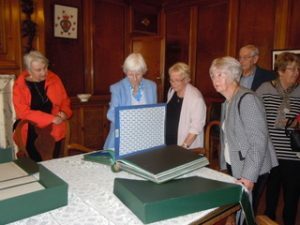 One was a sample book of Nottingham Lace and the other the Visitors Book which contains the signature of visiting Royalty and dignitaries who have been given the Freedom of the City (which allows them to drive sheep over Trent Bridge). We visited the Mayor’s and Sheriff’s offices which are still based here and were lucky enough to meet the Lord Mayor Councillor Mohammed Saghir who arrived whilst we were in his room. The second party was taken round by a gentleman from the Civic Society who started the tour by taking us up to the third floor in the original Art Deco lifts from 1929 which are far more roomy than modern day ones. 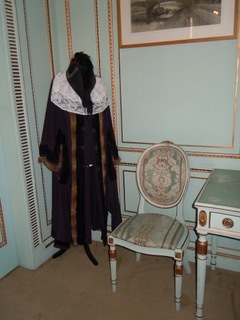 Once again we couldn’t visit the Council Chamber although we did manage to peek through the windows. On this visit we went in a few rooms we hadn’t seen before and even on to a small balcony to look out into the Arcade area. Both tour guides made the visits very interesting and if you have never been I would heartily recommend it if you get the chance in the future. 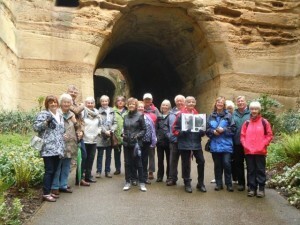 Forty members came on two walks led by Barbara Gani, Julie Arbuthnott , Pam Charity and Ron Madeley. Starting at the Eye Hospital situated on The Ropewalk, we walked to the site of the Casualty Department (now Harts restaurant) noting points of interest on the way. We proceeded down Park Row turning right into Postern Street and continued to the Jubilee wing (the circular wards) and onto the oldest part of the General Hospital. Here we learnt about the history of the hospital which started in 1781. We then went to 76 St James Street to view the plaque commemorating the stay of Lord Byron in 1798. There is also a plaque on St James Terrace, to mark the start of the Civil War and here we heard how the war affected Nottingham. We then turned right into Standard Hill to view Memorial House, the nurses home. On the road at the bend into King Charles Street is an additional plaque for the Civil War. We proceeded to Nottingham Castle and were told of some of its 1000 years of history. On Castle Road we saw the iconic statute of Robin Hood; from there we walked to the plaque for Marshall Tallart, the French commander who was defeated at the Battle of Blenheim in 1704 and who was detained at Newdigate House, situated on Castle Gate. The church of St Nicolas can also be viewed from this point, it has a diagonal clock face and the building was used by the Royalists during the Civil War. The impressive medieval Severns building is just around the corner back on Castle Road. A short walk to the Trip to Jerusalem, possibly one of the oldest drinking establishments in England and Brewhouse yard, which has been on this two acre site since at least 1217, ended our tour. Thirty seven members came on the two walks which commenced at the Monument Gate into the Forest to look at the memorial to the fallen of the Boer War, before walking along Forest Road East stopping to look at both the Boys and Girls High Schools. The Boys High School being founded in 1513 by Dame Agnes Mellers after the death of her husband. Henry VIII sealed the schools Foundation Deed in November of that year. We then stopped at the top of North Sherwood Street to learn about the Jewish Cemetery hidden away behind a stone wall. This was opened in 1823 and used until the 1860s, now obviously forgotten and rarely visited judging by the ivy clad doorway. We then went across to the Church Cemetery which opened in 1856 being built on a former sand quarry and incorporating various sandstone rocks and sand pits left behind by the quarrying, hence the name of “Rock” Cemetery which is what most Nottingham people know it as. For most of us it was our first visit to the cemetery and we were all intrigued by the way the graves have been incorporated into the rocks and caves of the former quarry. We looked for the graves of various well known Nottingham business men, including Sir Frank Bowden (Raleigh Cycles), Thomas Adams the Lace Manufacturer, the Architects Watson Fothergill and T C Hine, and James Shipstone the Brewer, as well as numerous other forgotten Nottingham men and women whose lives are recorded on their gravestones. We finished the walk on The Forest – starting at The Forest Lodge a former Police/Keepers Lodge with its basement cell and the Inclosure Oak (planted with an acorn from Windsor Great Park to commemorate the 1845 Inclosure Act). We learnt about early sporting events held on the Forest as well as admiring the up to date facilities recently completed with the aid of a Lottery Grant. The walks finished at The Pavilion in the Homemade Cafe where we all enjoyed a drink and something to eat. The Discovering Nottingham Group enjoyed tours organised by Len Marsh on the 13th and 29th July, 2016. First an interesting walk from the Lace Market down Hockley to Sneinton Market. 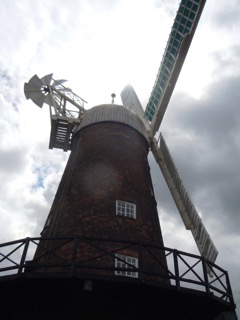 Then up Sneinton Road to Windmill Lane and on to Green’s Windmill. 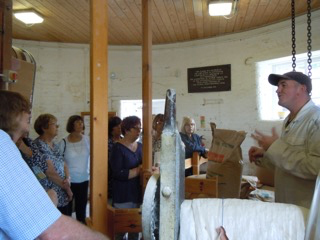 We had a tour inside the mill and a talk on the workings of the mill by the Miller. Outside we viewed the community garden which is still a work in progress but displays excellent garden produce. 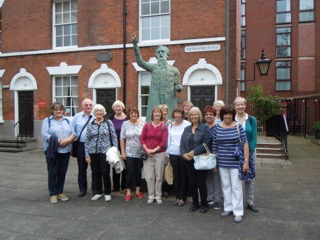 Then a visit to the William Booth’s house and birthplace museum which is close by. This was a hidden gem, the museum and artefacts are displayed in wonderful original settings and we were given interesting talks by both curators. Both of these venues were visited on the same day as they are sited very close to one another but could be seen separately. I can personally recommend other members visit both the venues. A brochure of information is now available for other members to read. During June the Discovering Nottingham group met for a walk along Nottingham’s Mansfield Road from the corner of Parliament Street up to the junction with Forest Road and back into the city finishing off with a visit to the Victoria Hotel. A total of 34 members led by John Beech ably assisted by Barbara Wigley met at Phoenix Park and travelled by tram into Nottingham, where they gathered outside the main entrance to the Intu ‘Victoria’ shopping centre. Here they were told about the continuing redevelopment of the area since the 1830s and that until that time Parliament Street represented the northern boundary of the city. They then went on to examine the old clock tower which is all that remains of the Nottingham Victoria Station building that stood on the site until the early sixties, and visited the site where the tunnel out of the station can still be seen. They then continued up Mansfield Road, passing the Rose of England public house attributed to the architect Watson Fothergill (or is that Fothergill Watson, the controversy reigns) strolled along Elm Avenue an oasis of peace and calm from the noise of the traffic and a good choice for the site of the Hollygirt School. At the junction of Forest Road they began the return journey, noting that a set of gallows had once stood at this junction, along with one of Nottingham’s many lost windmills. On the way back they passed a plaque on the wall of a house that was once the home of the artist Henry Dawson, they continued to the former Bluecoat School building which displays two striking statues of boy and girl pupils. They then continued over to the Hilton Hotel, formerly the Victoria Station Hotel where they learnt of the many changes that had occurred to the hotel including the jacking up of the whole building by 5 feet to accommodate the current layout. Coffee and tea was taken and group members were able to peruse the hotels own archive album. 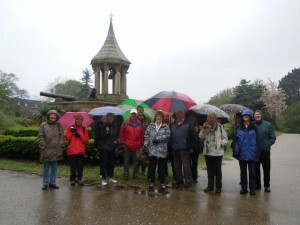 Eighteen members of the Discovering Nottingham Group met on a wet May day to explore the Nottingham Arboretum, General Cemetery and Canning Circus area finishing at The Park Tunnel. Barbara Wigley led this walk ably assisted by Freda Todd. 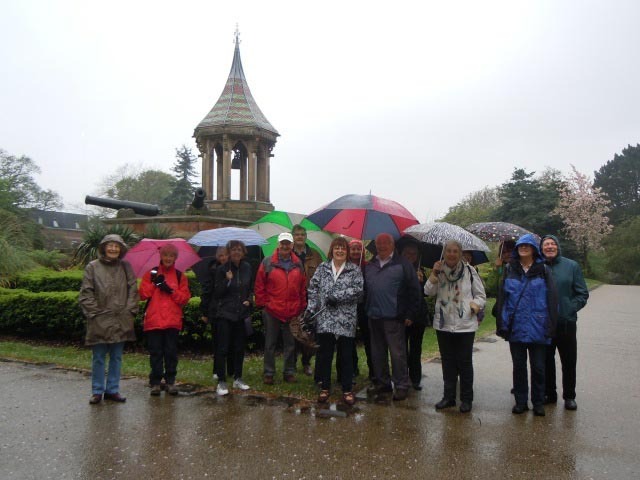 The group learnt that the Arboretum was Nottingham’s first public park opening in 1852 and covering 17 acres with over 1000 specimen trees, some of which are from the original planting. We visited the Chinese Bell Garden, looked at statues of Nottingham worthies as well as looking at the baby ducks on the lake and birds in the aviaries. On leaving the Arboretum we learnt about the Nottingham School of Art and Terrace Royal with its ornate stone carved entrance doors, before visiting the General Cemetery and walking up to Canning Circus. On the way visiting the War Memorial and graves of Benjamin Mayo a Nottingham eccentric and Daft Smith Churchill who drowned on the Forfarshire wreck off the Farne Islands in 1838 (Grace Darling didn’t manage to save him!). Members were surprised that the cemetery covers 18 acres and in spite of being so close to the city centre was very peaceful. We learnt that Canning Circus was previously called Zion Hill and prior to that the Sandhills and that there had been three windmills there at one time. 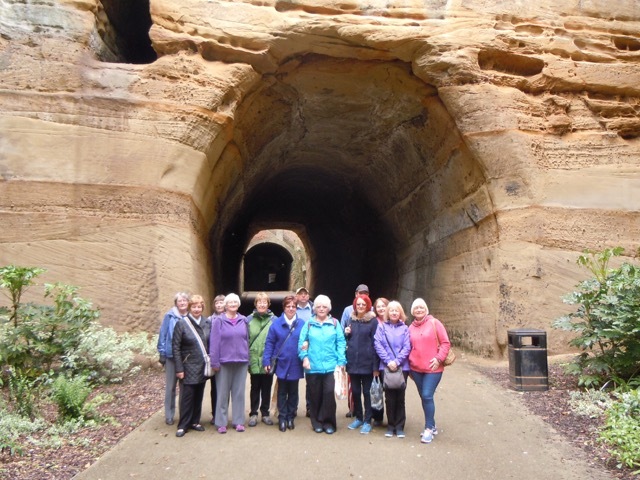 We had a lunch stop at The John Borlase Warren Pub and came out to sunshine for the short walk down The Ropewalk, and the steps leading down to The Park Tunnel. Most people hadn’t seen this tunnel before and were fascinated by it. It was a short walk back on to Derby Road and the end of the walk. Bell tower at the Arboretum.